Small enough to explore on foot, you can follow the stories of Lancaster’s rich history all the way back to the 12th Century. As one of England’s Heritage Cities, there is history around every corner, from the conviction of the Lancaster Witches in 1612 to Charles Dickens’ hotel room. 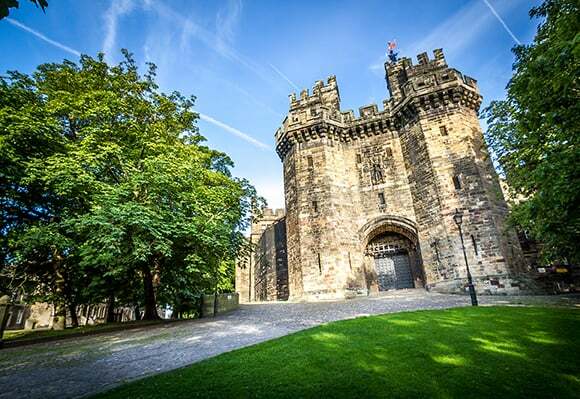 Dating back almost 1000 years, Lancaster Castle is still owned by Her Majesty the Queen, who is the Duke of Lancaster. As well as being a fortification, its courtrooms have witnessed many famous trials over the centuries, including those of the Lancashire Witches who were convicted and sentenced to death in 1612. Lancaster Castle is open to the public, offering visitors a chance to walk the halls of one of the best-preserved castles in Great Britain. Conference attendees may wish to join an evening guided tour of the castle (£8 per person, payable at Registration). By day, a strong 'coffee culture' vibe runs throughout the city, with the Atkinson's roaster wafting its aroma onto China Street, and many cafés dotted throughout the cobbled streets. The city boasts a wonderful mix of restaurants offering a host of different cuisines, including a Japanese sushi bar, Mexican, French and Spanish restaurants to vegan eateries. Lancaster's nightlife buzzes with live music at the many pubs and wine bars within the city, situated along the banks of the canal, through the Georgian streets and even underneath the city in the castle's former wine cellars. The city has a great shopping scene, with many independent shops and boutiques nestled alongside stores from many major retailers. Our traditional high street is also home to the bi-weekly Charter Market – a selection of 40 stalls offering everything from fresh produce and delicious dishes from around the world to books and gifts. Click here for maps and travel directions. Click here for information on hotels and accommodation.